One of Valencia’s unique architectural highlights is the miramar — translating literally into “look at the sea”. The miramar is immediately recognizable; a small square-shaped tower plopped on top of a building’s roof. Miramars were intended to give homeowners a better view of the city and the sea. Normally, the tower is accessed from the building terrace. The main, square room has glass windows on all four sides, in order to provide the best view possible. It’s a Valencian oddity which gained wide-spread popularity among the upper-crust starting in the 17th century. You can still find them in the city center and especially in the maritime district. Of course, as buildings got taller and taller, people kept building miramars at greater heights, until eventually giving up. 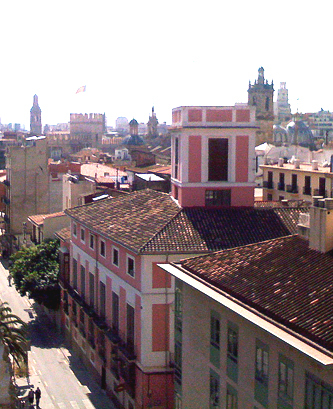 Nowadays, very few in Valencia probably boast a view of the sea. Still, they’re an interesting and unique piece of the city landscape.